A Better Roni: Dancehall Weekend! 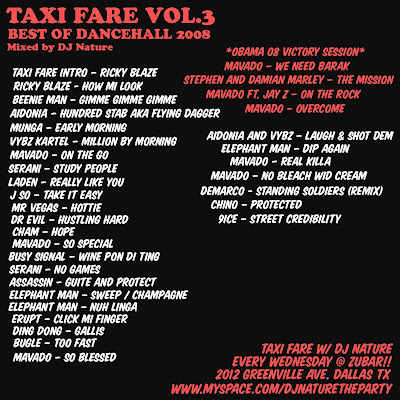 DJ Nature "Taxi Fare Vol. 3"
DJ Nature put this up at the beginning of the month and it slipped by me. Pretty much all I desire to listen to right now is dancehall, thanks to my extraextrahotoffthepress Major Lazer in large part. "TAXI FARE Vol. 3 Best of Dancehall 2008 is uploaded and ready for download. 2008 was such a big year for Dancehall music. So many huge tunes, huge moments. From Usain Bolt's 9.68 seconds to Mavado and Cocoa Tea's hair raising Barack Obama anthems... Jamaica was on fire last year!! I really tried to bring the excitement of this past year's music and events to the mix, covering all the the big tunes like Sweep, Nuh Linga, So Special, No Games, 100 Stab... Tunes that at their own particular point in time were literally the hottest joints in the dance."